Video footage has been released by Bloomberg News that shows the dramatic moments following the terror attack at the Brussels Airport Tuesday morning. The explosions at the airport — at least one of which is reported to be a suicide bombing — were the first two of at least three to occur in the Belgian capital. Less than two hours later, another explosion rocked a metro station just blocks from some of the European Union's most important institutions. Much remains unknown about the attacks, but this dramatic scene gives you an idea of what those who survived the airport attacks experienced. The video begins in the departure hall, with the videographer huddled next to a check-in desk. Smoke fills the air, and you can hear a man and woman repeat in English, "It's OK, it's OK, it's OK," seemingly to their young child or children. The people in the maze-like line, which moments earlier would have been full of people standing, impatiently waiting to check in, seems empty until you realize that they are crouching among their suitcases. A man's voice asks if it was terrorism, and people slowly start to get up and walk away, leaving their belongings behind. In the distance, you can hear an alarm go off. The people closest to the camera remain huddled against the counter, seemingly too afraid to move. 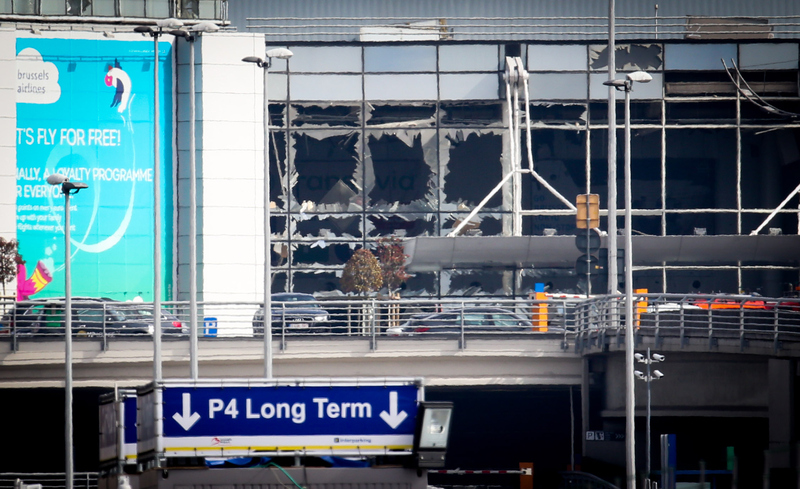 At the airport, 14 people were killed, according to Belgian public broadcaster VRT. An airport worker told Reuters that many of those killed and injured were wounded in the legs, suggesting a bomb on the floor — perhaps in a bag — in addition to the suicide bomber. A third explosive device, an unexploded bomb belt, was found by police later on Tuesday. The bomb squad was expected to carry out a controlled explosion on it. Some of the first social media posts to come out Tuesday were just as frightening. One of the first videos taken from outside the airport showed passengers fleeing the main terminal building as smoke billowed out of the shattered glass windows of the departure lounge. Another, shared on Facebook, showed the aftermath inside, where shattered glass and a collapsed drop ceiling littered the floor. About 75 minutes later, a third blast struck the Brussels metro system, killing what are now estimated to be 20 people, according to the city's mayor. Another 106 people were injured — 17 of them are in critical condition. Two men have already been arrested in Brussels in connection with the attack, but more are on the run. Security cameras have the bombers on camera. Residents have been asked to remain put as the police continue their investigation.